An attractive ornamental tree. The Sweetgum Tree (Liquidamber styraciflua 'Worplesdon') cloaks itself in appealing decorative foliage. Frequently, considered to be related to maples as its leaves are somewhat similar in shape, but no relation!. In North and Central America, this is a native woodland tree, with its timber imported as satin walnut for furniture. However, in Britain, it is the more the foliage that makes it worthy of planting. When its foliage is crushed, it gives a rather pleasant, sweet resinous aroma. Expect a final height of 28m (93ft 4in). A large garden is a pre-requisite, to truly appreciate this tree. 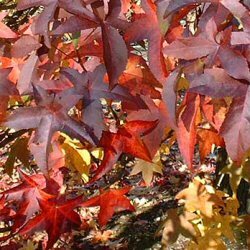 Our Sweetgum Tree is supplied at a height of between 150 - 200cm in a 7 - 12 L container for year round planting and better results than from bare-root or root balled stock.